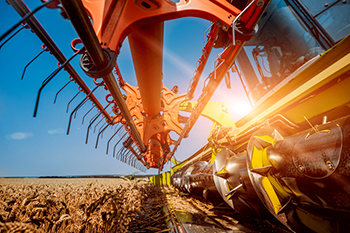 Farm equipment has allowed for great advancements and efficiencies when it comes to planting and harvesting crops, but it also introduces additional risks and safety concerns. Like other pieces of machinery, farming equipment can be dangerous if not operated properly. It’s built to do hard work, to till, plant, forage and harvest. According to the Department of Labor, in 2011, 48 percent of fatalities in agriculture were due to vehicular accidents. These accidents include tractor rollovers, which are the deadliest type of injury incident on U.S. farms. Safety is a combination of keeping equipment in good working condition and ensuring the person operating the equipment is able and aware. First and foremost, to practice good farm equipment safety it’s important to read and comply with the operator’s safety manual. The material is meant to educate and keep the operator safe. Use the equipment the way it was intended to be operated, means to keep all guards, shields and access doors in place while in operation. Understanding and properly maintaining farm equipment is only half of the equation; it’s also equally important for the operator to take precautions, too. Any worker that operates farm equipment should be trained to safely and efficiently use it. Farm equipment operators should be well rested and focused on the task at hand. Operating farm equipment safely also means dressing appropriately. Untied shoelaces, loose hair and ill-fitted clothing can have dire consequences. When servicing farm equipment always turn off the engine, disconnect the power source and wait for all moving parts to stop. To protect both yourself and the general public, follow federal and Pennsylvania state laws on farm equipment safety. As a general precaution, keep children and other people away from the work area. If you or a loved one has been injured due to a farming equipment accident, seek the counsel of an experienced personal injury lawyer. Contact KBG to get the Results You Deserve®.